Early Christianity | J.W. Wartick -"Always Have a Reason"
Apologetics in the Roman Empire is a collection of essays centered around apologetic interaction between Pagans, Jews, and Christians in the first through fourth centuries. The essays cover a wide range of topics, from Pagan attempts to defend Hellenism to the apologetic writings of Eusebius. The value of this book is found primarily in a survey of the interplay between Pagan, Jewish, and Christian apologists during this time period, but from these interactions, readers can find a number of applications. The apologetic styles early Christians used allow readers to seek to apply them to their own reasoning. Some of the early arguments Pagans made against Christians have been reiterated in our own time, and the responses Christians gave can be integrated and updated in reply. Each individual essay has a virtual treasure trove of content that gives insight into how apologetics was done but also in how it might be done into today. I found every essay to be compelling and insightful. Unfortunately, the editors themselves argued early on that few people would be interested in a study like this beyond learning about the time period being discussed (I briefly look at this quote and claim here). I disagree vehemently. This is a book from which anyone interested in apologetics will glean much. 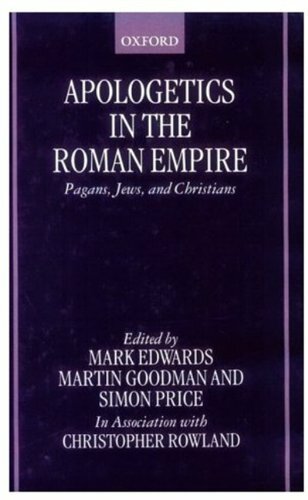 I cannot recommend Apologetics in the Roman Empire highly enough. Its broadness of application is far beyond the seemingly obscure appeal to those specifically interested in this period. Whether one is looking into how to approach apologetic styles, how Christian thinkers of the past dealt with certain objections, or how debates which occurred in the first few centuries of Christianity impact our thought today, readers are treated to a wealth of research and information which will bear fruit in their thought.